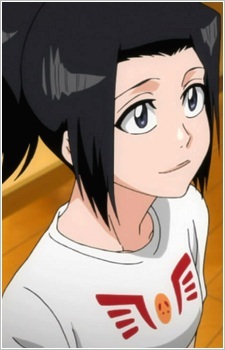 Karin is the cynical and sarcastic daughter of Isshin. Compared to her soft-spoken twin, Karin is the more authoritative of the two. She is an excellent soccer player with a kick powerful enough to fight weak hollows. Karin's tough exterior results from her mother's death; because she could not be useful around the house like Yuzu, she resolved never to cry so that she would not burden her family with her personal troubles. Karin is a sensible person and will not hesitate to kick her father in the head when she thinks he's acting unreasonable. She initially claims that she believes spirits do not exist, yet can see them just as well as Ichigo can. She can also sense them from great distances, which usually manifests as a headache. In spite of her attitude about spirits, Karin is willing to use her abilities to earn a little cash, such as her position as Karakura Red of Don Kanonji's Karakura superheroes. Karin actually knows that Ichigo is a shinigami and wants to know why he's suffering out of concern. Karin is a homonym for Japanese quince, a name of a fruit, which matches Ichigo's name being a homonym for strawberry. After the fight against Aizen, the story skips in time; Ichigo has then lost all of his Shinigami powers. It's been said that Karin's spiritual powers have expanded. She does not speak with Ichigo about her powers, claiming that her brother always suffered and protected the family and now it's her turn to protect him.